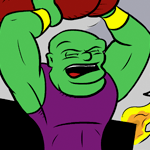 Classification: Smash’s cosmically-powered super abilities combined with his combat training allow him to be classified as both a Warrior and a Cosmic Entity. History: An alien from a distant world, Smash stowed away on a cargo ship bound for a nearby planet. He found that due to the abnormally high density of his home world, he had super strength on the majority of other planets. He joined the crew of The Skipper headed to the stars, where a series of exploits brought him to be recruited by the Superpower Union. He quickly adapted to the hero lifestyle, but as one of the junior members, he gets stuck working all the bad shifts. It should be noted that on his home planet, Smash is considered small and weak in comparison to his people. Since Gary’s arrival in Victory City, Smash has taken him in as his roommate and the two have become fast friends. To think, I was cnofeusd a minute ago.